Kementerian Desa, Pembangunan Daerah Teringgal, dan Transmigrasi Republik Indonesia – Kemendesa PDTT or referred to as “Kementerian Desa PDTT” is the Ministry of Village, Development of Disadvantaged Regions, and Transmigration of Republic of Indonesia. Kementerian Desa PDTT is one of ministry in Indonesia with main task to assist the President of Republic of Indonesia in conducting affairs in the field of rural development and rural areas, rural community empowerment, accelerating the development of disadvantaged areas, and transmigration. According to Kementerian Desa PDTT’s profile as cited by JobsCDC.com, Kementerian Desa PDTT is under and responsible to the President of Republic of Indonesia. 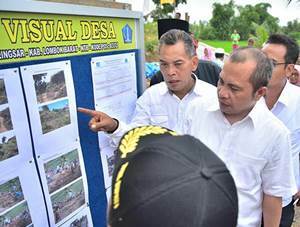 Kementerian Desa PDTT is headed by a Minister for Village, Development of Disadvantaged Regions, and Transmigration (Since 27 October 2014 held by Marwan Ja’far). Kementerian Desa PDTT has its legal domicile in Jakarta and its head office is registered at Jl Abdul Muis No 7 Gambir, Jakarta. Minimum 2 years of experience in the field of village development activities and / or community development. Have a good knowledge and expertise in organizing the implementation of programs and activities in the village. Past experience in capacity building, regeneration and community organizing. Strong understanding about the system of participatory development and village government. Able to work together with government officials village. Computer literate, minimum Office (Word, Excel and Power Point) and internet programs. Able to work full-time and willing to be placed at a job site. Minimum age of 25 years and a maximum of 45 years. Not serve on the board of political parties and / or engaging in political activities that could interfere with the performance. Past experience in the field of village development activities and / or community development for at least 4 years (D3) and 2 years (S1). Experience in facilitating inter-agency cooperation at the level of the village community. Able to to provide training and guidance covers aspects of facilitation of training events, facilitating regeneration and master the methodology of adult education. Minimum age of 25 years and a maximum of 50 years. Past experience in the field of rural infrastructure development for at least 4 years (D3) and 2 years (S1). Have experience to provide training and technical assistance construction in a simple. Minimum 5 years of experience in the field of village development activities and / or community development. Have a good knowledge and expertise in organize the implementation of sectoral programs and activities. Have experience in facilitating cooperation between institutions of society. Able to perform policy analysis of the implementation of programs in the region. Strong understanding about the system of participatory development and regency administration. Able to provide training and guidance covers aspects of the preparation of simple modules, facilitating delivery of training, the facilitation of regeneration and master the methodology of adult education. Able to work together with government officials regency/municapal. Minimum age of 30 years and a maximum of 50 years. Minimum S1 in Civil Engineering. Minimum 5 years of experience in the field of village development and / or community development. Have a good knowledge and expertise in organize the implementation of sectoral programs and activities, particularly those related to infrastructure development. Strong understanding about the system of participatory development and district administration. Able to provide training and guidance related to village infrastructure development. Have experience in planning, implementation and control in engineering work. Have a good knowledge and expertise in organizing the implementation of sectoral programs and activities in the development of the rural economy. Have experience in participatory village development and development planning cycle Regency / City. Able to to provide training and guidance in the planning, implementation, monitoring and evaluation of participatory development. Minimum S1, preferabaly in Economics. Have experience in the development of the rural economy. Able to provide training and mentoring the development of the rural economy. Have a good knowledge and expertise in organizing the implementation of sectoral programs and activities in the development of appropriate technologies. Have experience in the development of appropriate technology for socio-economic development of the village. Able to provide training and mentoring in rural areas of appropriate technology. Minimum S1, preferabaly Education or Health. Have a good knowledge about the minimum service standards in the field of education and health as well as experience in the development of education and health. Able to provide training and mentoring in development of education and health.